Live Health Fairfax is holding the Healthy Community Design Summit on Tuesday morning, May 6 at the Kena Conference Center, 9001 Arlington Boulevard, Fairfax. Registration begins at 8 am; the program will be from 8:30 to 12 pm. Register at eventbrite. Biking is an important component of creating a healthy community. See our blog post on the Fairfax Community Health Improvement Plan approved by the Board of Supervisors last year. 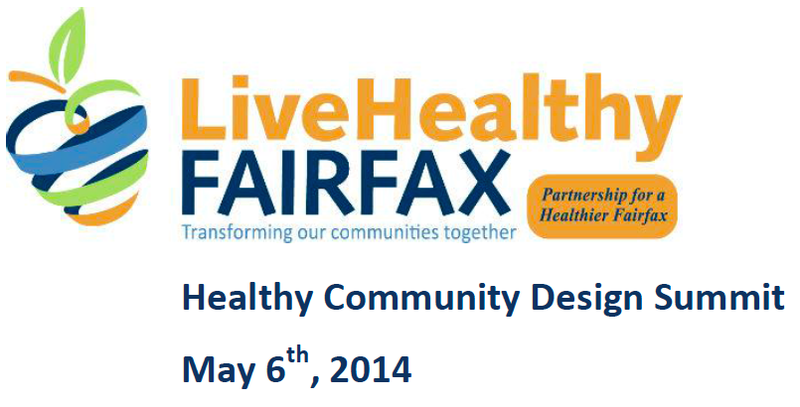 Live Healthy Fairfax is pleased to announce the Healthy Community Design Summit. This event will highlight how economic health, environmental health and public health are essential building blocks for a thriving community. The keynote speaker is Mark Fenton, a national public health, planning and transportation consultant and an expert on walkable communities. Learn how communities throughout the U.S. are encouraging active living through design of the built environment. Hear from a panel of local business, development and planning experts about their strategies for and successes with integrating healthy design throughout the Fairfax Community. Brainstorm with your colleagues on ways to make your neighborhoods more friendly for pedestrians and bicycles and accessible to all people. Help craft a message for leadership that demonstrates the benefits of health in all policies – especially throughout the built environment.